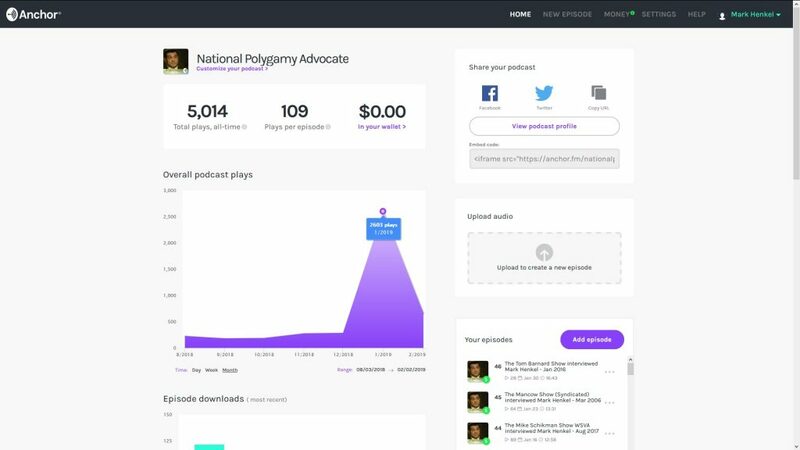 Earlier today, February 3, 2019, the National Polygamy Advocate ™ PODCAST crossed over the 5,000 play-count mark. This milestone was achieved in less than a year after only 46 weekly episodes that began on March 21, 2018. What makes this news even more additionally exciting is how the latest metrics compare with the metrics over the previous 6 months. Indeed, at the end of the previous calendar month (December, 2018), it was already exciting to see that the podcast had reached a new monthly record total of 286 total plays for that month. Here is the list of the total month play-count for the last several months of 2018. By mid-January 2019, that month total record was being doubled, tripled, and more! By the end of January, a new record total month play-count had been reached. Not only was that whopping record in the range of being 10x all other previous individual month totals, but that one-month total of January 2019 even exceeded the entire total of plays from the beginning of the podcast itself. And the climb didn’t stop there. Observe the month-to-date (as of this Sunday morning on Febrary 3, 2019) total so far this month. One last note, achieving this new 5,000+ milestone has also increased the avergage “Plays per episode.” Back in December, 2018, that average was climbing up past 30. But now that average has shot up past 100! So, yes, today it is truly exciting to witness today’s milestone being reached, with the National Polygamy Advocate ™ PODCAST passing the 5,000 play-count mark.